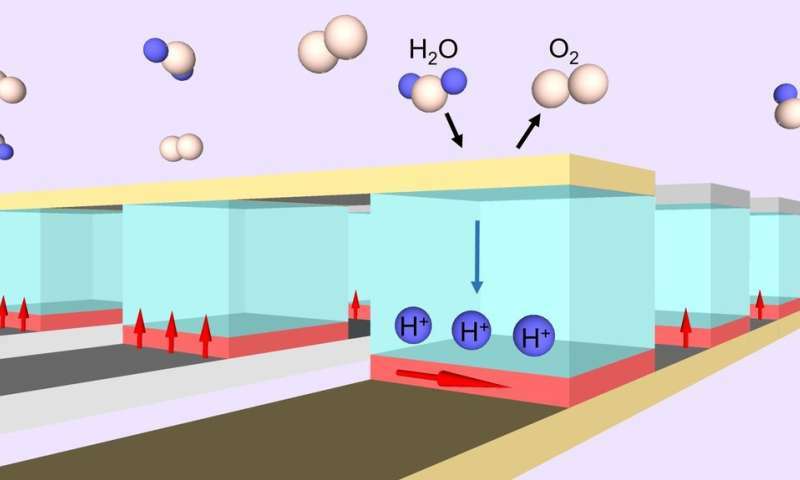 A team of researchers from the Massachusetts Institute of Technology (MIT) and the U.S. Department of Energy's (DOE) Brookhaven National Laboratory has determined how to use hydrogen ions, "pumped" from water in the air at room temperature, to electrically control magnetism within a very thin sample of a magnetic material. This approach for manipulating magnetic properties could speed up advances in computing, sensors, and other technologies. 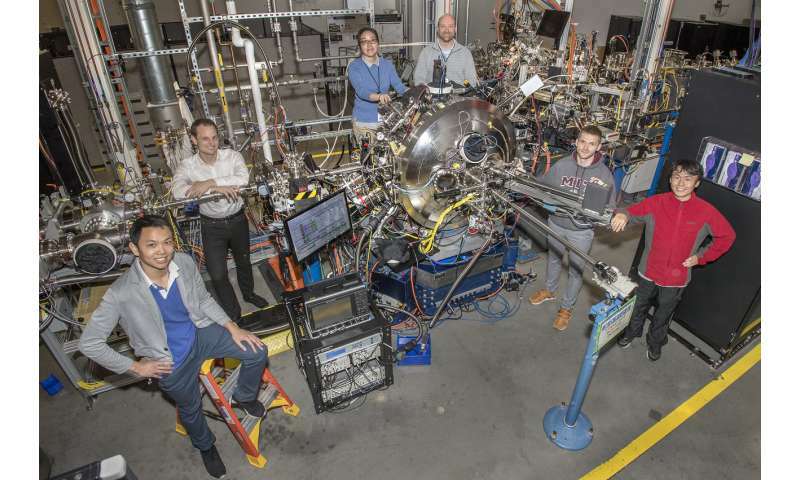 The research, described in the November 12, 2018, online edition of Nature Materials, was performed in part at Brookhaven's National Synchrotron Light Source II (NSLS-II), a DOE Office of Science User Facility. The measurements, taken at NSLS-II's Coherent Soft X-ray Scattering (CSX) beamline, were critical in revealing the microscopic mechanism involved, in particular the hydrogen ions' presence within the sample and their role in the changes of the sample's magnetic structure. "As CMOS technologies approach the end of their roadmap, spin-based devices are being widely pursued for the beyond-CMOS era," said the study's lead researcher, MIT's Geoffrey Beach, a professor of materials science and engineering and co-director of the MIT Materials Research Laboratory. "One of the requirements for bringing spintronics into the mainstream is an effective way to electrically control magnetism. Essentially, we are trying to make a magnetic analog of a transistor." 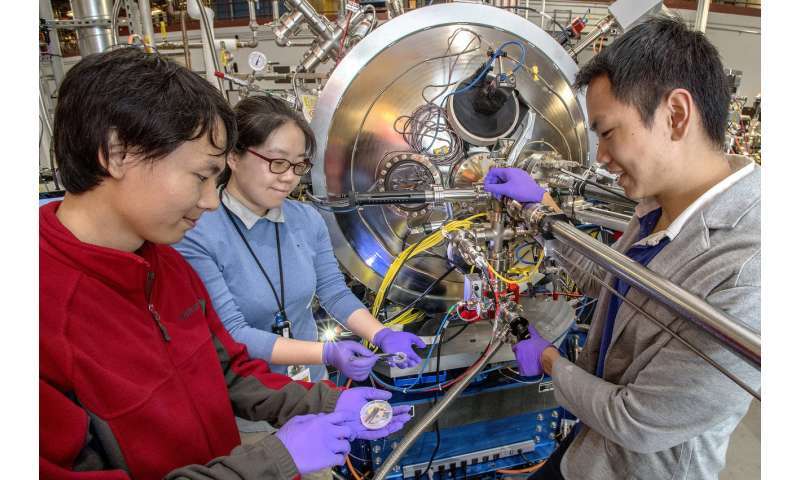 "Magneto-ionic switching is an important pathway toward electrically manipulating magnetism at low power," said lead Brookhaven researcher Wen Hu, a beamline scientist at the CSX beamline. "Hydrogen-ion migration, controlled by electrical voltages, plays a key role in this research and could potentially lead to new spintronic device applications." Members of the research team at the CSX beamline, where they confirmed the presence of hydrogen ions in their sample. Credit: From left to right: Aik Jun Tan, Felix Büttner, Wen Hu, Claudio Mazzoli, Ivan Lemesh, and Mantao Huang. The researchers demonstrated the use of hydrogen ions for reversible magneto-ionic switching in a layered structure consisting of a platinum base, cobalt, palladium, gadolinium oxide, and a gold contact to top it off. Palladium (Pd) is well known for its ability to store hydrogen within the "nooks" of its atomic lattice. Placing a voltage across the sample, and alternating between a positive and negative voltage, can pump hydrogen in and out of the Pd layer, switching the magnetism back and forth from out-of-plane to in-plane. This is the first time that scientists have demonstrated reversible "hydriding" of a heavy metal. "We performed XAS measurements with a very small X-ray beam (approximately 100 microns) to aim at the active part of the engineered structure. We observed a clear shift in the Pd spectrum when changing the voltage applied to the sample, which was a sign of the transformation of Pd to PdH," said Claudio Mazzoli, lead beamline scientist at the CSX beamline. "These measurements provided direct evidence of the microscopic mechanism happening deep within the sample. Thus, we now know that the insertion of hydrogen into the device is the explanation for the changes in the sample's magnetic properties as detected by lab measurements." "This is a very novel and unique method, and it opens up an entirely new way of modulating magnetic fields in solid state devices, potentially impacting spintronic applications," said Hu. Not sure you understand what is really happening. Are we swapping orbiters, [ (p, e) = ( p n e)], source, dynamics Looks ok; However, there exist a possibility of Fission! i.e. scale, harmonics, etc. the waves or equal potential spheres, collectively? No, that is a question!